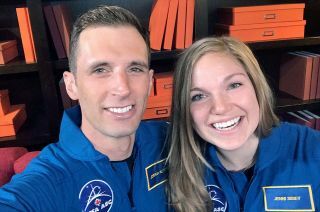 Joshua Kutryk and Jenni Sidey have been named as the Canadian Space Agency's 2017 class of astronaut candidates. Canada revealed its two new astronauts on Saturday (July 1), as part of the nation's celebrations of its 150th anniversary. Lt. Colonel Joshua Kutryk of the Royal Canadian Air Force and Jenni Sidey, an engineer and lecturer at the University of Cambridge in the UK, were introduced by Prime Minister Justin Trudeau as Canada's fourth astronaut class. Kutryk and Sidey are the 13th and 14th Canadians to be selected by their government to train for spaceflights since 1983. "As we celebrate our history, we also have an opportunity to look towards the future," said Trudeau, who was joined by Navdeep Bains, the Minister of Innovation, Science and Economic Development, as well singer Shania Twain and two girls, who, despite their young ages, applied to become astronauts. "Today, it is my honor to introduce you to Canada's next two astronauts!" Trudeau exclaimed, as Kutryk and Sidey stepped out onto the stage. The two were selected out of a pool of 3,772 applicants, from which 1,706 passed a public service entrance exam. The candidates needed to be in excellent health and have a university education in science, engineering or medicine. They needed to reside in Canada or be Canadian citizens residing abroad and be proficient in English or French (or preferably, both). An initial 163 candidates underwent medical examinations and further testing. Out of those, the pool was narrowed over several months from 72 to 32 to 17 top finalists, from which Kutryk and Sidey were ultimately chosen. "Throughout the recruitment campaign, Jenni and I met some amazing Canadians — scientists, doctors, engineers, pilots like myself — there is so much talent in this country," said Kutryk. "It is an honor to be standing here today as a new Canadian astronaut." New Canadian astronauts Joshua Kutryk and Jenni Sidey, as seen backstage at the Canada 150 celebration on Parliament Hill. "Now I am proud to have served Canada as part of the Royal Canadian Air Force and today I am very proud to be joining the Canadian Space Agency," he said. "I stand on the shoulders of the great Canadian astronauts before me. They inspire me to be the best that I could be. And I will do everything I can to follow in their footsteps." Born in Fort Saskatchewan, Alberta, Kutryk, 35, studied at the Royal Military College of Canada in Kingston, Ontario, Embry-Riddle Aeronautical University in Florida and at Air University in Alabama. Prior to being selected by the CSA, Kutryk worked as a test pilot and fighter pilot in Cold Lake, Alberta, and as a CF-18 fighter pilot in Bagotville, Quebec. Sidey, 28, was born in Calgary, Alberta. She received her bachelors in mechanical engineering at McGill University in Montreal and earned her doctorate in engineering at the University of Cambridge, where she studied flame physics and combustion. "Thank you to the Canadian Space Agency for choosing me as an astronaut for this wonderful country," said Sidey. After visiting CSA's headquarters in Saint-Hubert, Quebec on Tuesday (July 4), Kutryk and Sidey will report to the Johnson Space Center in Houston on Aug. 21, where they will join NASA's recently announced 22nd astronaut class to begin two years of basic training. Canada currently has two active astronauts awaiting their first spaceflights since being selected in 2009. David Saint-Jacques is currently training to launch to the International Space Station in November 2018. Jeremy Hansen is still awaiting his flight assignment, but is expected to fly before 2024. Kutryk and Sidey, once qualified as astronauts, will support CSA's participation with NASA and other space agencies from around the world on future deep-space missions. "Our new astronauts will represent Canada, advance our understanding of our planet and our universe, and inspire the next generation of Canadians," said Trudeau. Canada's first astronaut in space (and current Minister of Transport) Marc Garneau launched in October 1984 on the space shuttle Challenger. Since that first flight, nine other Canadians have lifted off on 16 space missions, including Roberta Bondar, Canada''s first woman in space, and Chris Hadfield, the first Canadian to walk in space and command the space station. New Canadian astronauts Joshua Kutryk and Jenni Sidey (at right) meet with Canadian astronaut Jeremy Hansen. "Back in 1992, when I was just a few years younger than these girls on stage with us today, Roberta Bondar flew on the space shuttle Discovery and when she came back to Earth, I was fortunate enough to see her speak," recalled Sidey. "I remember looking up to her, being excited at the idea of being a scientist, being a Canadian and having the opportunity to explore places beyond our world." "So today I am grateful to have had that role model, and that memory makes this moment so powerful for me, as a woman and as a Canadian," she said. Canada's other earlier astronauts include Steve MacLean, Julie Payette, Robert Thirsk, Bjarni Tryggvason and Dave Williams. Astronauts Ken Money and Michael McKay were also selected but left training before flying in space. In addition to its astronauts, Canada has also developed experiments that were flown aboard the space shuttle and International Space Station, and provided the robotic arms for both. The Canadarm2 remote manipulator and Dextre special purpose dexterous manipulator are in use on the space station today. See more photos and video of Canada's new astronauts Joshua Kutryk and Jenni Sidey at collectSPACE.